This tune is for Bonneville/T100 owners who intend to install the Breathe airbox intake cover, DNA high performance air filter, short aftermarket free flowing silencers (e.g. Lossa Stubbys, Megaton Rev Cone, D&D Rev Cone, EMGO Shorty Rev Cones etc. ), along with removal of the internal airbox baffle. This kit is very easy to fit, the instructions are clear & concise, & if you follow them, you won't have any problems! Being an old git, I am a bit wary of computers & tech, but this really was simple! The results are amazing! I fitted mine with Sprint 2:2 short pipes & it's changed the bike from being a wheezy, but game pit-pony, to a thoroughbred! 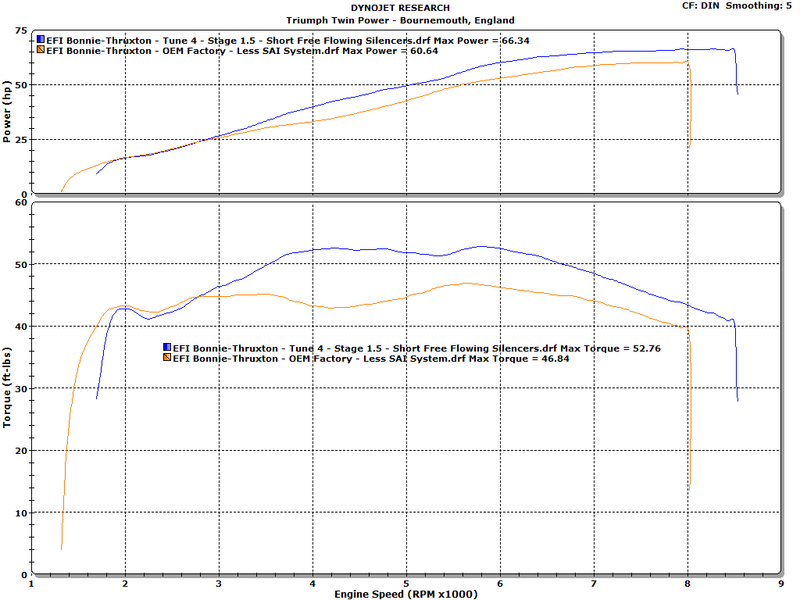 Loads more power all the way up to 8500, with a really noticeable boost in the mid-range. Mike is very helpful, nothing was too much trouble. Best money I have spent on my bike, will be spending more at TTP, no doubt about it!